Electoral maps and exit polls tell us the same story: Marine Le Pen's electorate was poorer, more working-class/blue collar (CSP-), less ideological, younger, less Catholic and more concentrated on traditional left-wing areas than ever. Gauche-lepénisme at full force. No wonder she won the department of Gard, a Communist stronghold. Why is this important? Traditionally these FN the constituencies tend to sit out or even vote for the socialist candidates in the run-off at a much higher rate. Therefore any scenario of the FN vote coalescing around Sarko is now more unlikely than ever. Socio-economic demographics is destiny in this case. Looking at a Marine 2012 vs. Jean-Marie 2002 vs Jean-Marie 2007 map is fascinating. 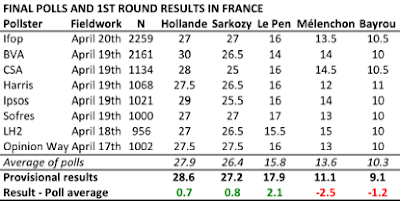 Sarkozy retained most of the CSP+, upscale, traditionally right-wing voters he regained 5 years ago; the blue-collar voters happily went back to Le Pen (and were joined by some of their peers who had been sticking with the left). Let's face it: barring a total screw up by Hollande (it's still the French left), Sarkozy is screwed. He hasn't lead on a poll since 2009. Stick a fork on him. Pedro Magalhães, alguma opinião sobre o que possa ter acontecido ontem em Alberta? Parte foi voto estratégico por parte dos eleitores de esquerda que votaram PC para impedir uma maioria da Wildrose. Isso não explica tudo: a Wildrose teve menos 6% do que qualquer uma das sondagens dos últimos dias sugeria. Houve uma sondagem que capturou algum movimento, mas nada nesta ordem de magnitude. Há muito que não via um falhanço destes por parte dos pollsters. On Alberta, I know next to nothing. I'll have a look.